Our upcoming and quite frankly mind-blowing retreat to Khao Sok, Thailand, is one of the most beautiful places on our planet. Situated in the heart of an ancient rainforest, this nature’s lovers paradise is literally floating on a pristine freshwater lake, surrounded by magnificent limestone cliff formations that rise up to 950 meters high. So if the stunning scenery and rich biodiversity of this jungle yoga retreat inspires you to travel further afield, what other treasures does this region of Thailand have to offer? The answer is SO much we had to write four blogs exploring, in turn: the city/town; history/culture; animal watching; and of course the islands! But first an important reminder: part of the magic of this retreat is that it proudly offers no wifi or cellular services. So any travel plans will have to be made before your arrival. Allowing you to switch off and truly slow down, giving yourself entirely to the natural rhythm of the jungle. Surat Thani (airport) is our meet up point for group transportation to the retreat, and is a typical Thai town best known as a jumping-off point for the majestically beautiful Gulf Coast Islands such as Ko Samui, Ko Pha-Ngan and Ko Tao. Whilst travellers rarely linger here it is known in Thai as the ‘City of Good People,’ and is a great place to stop if you want to experience a real Thai working city, delicious Southern-style street food, and colourful temples and shops. Indeed, Surat Thani is a foodie’s paradise with a night market that immerses you in the local food and culture. Open every night, it is a cheap and friendly place to eat as well as a short walk from the riverside, where you can sit and enjoy your food. 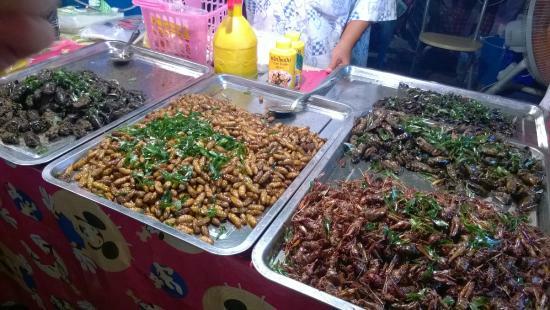 This is Thai food eaten by the locals, not just the tourists, and yes, you can try the insects if you must! Also near the river is the beautiful Surat Thani City Pillar Shrine, fantastic during the daytime but even better when illuminated at night. Locals believe that the spirit of the town lives within it. 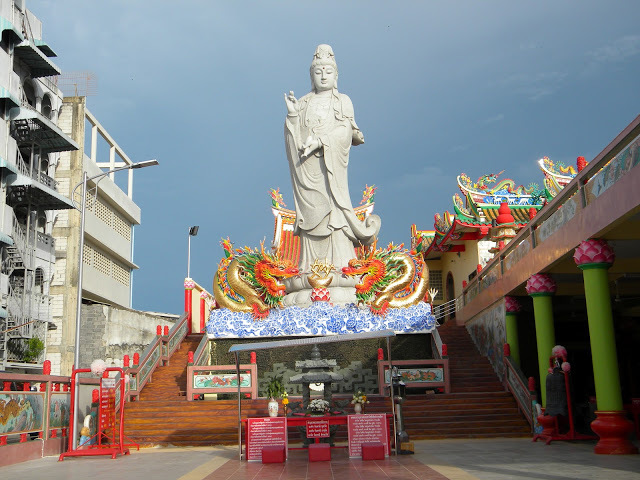 There is also a vast statue of Guanyin, the Buddhist bodhisattva of mercy and compassion. 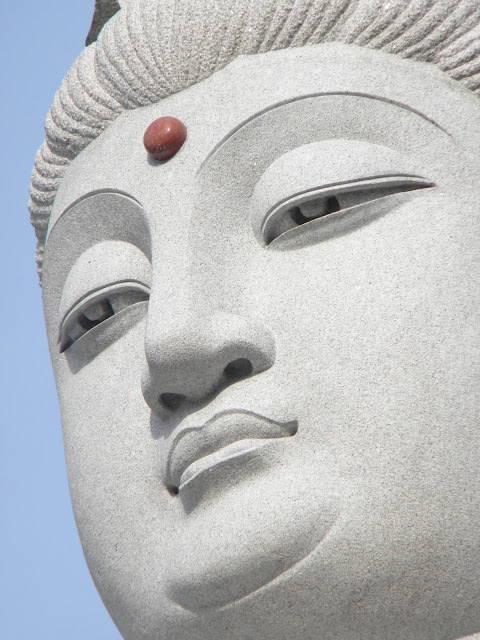 Associated more with the Mahayana tradition in which gender is no obstacle to Enlightenment, this goddess is seen as a source of unconditional love since she vows to liberate all beings from their karmic entanglements. Just behind and to the right of Guanyin stands a colourful temple dedicated to her name.